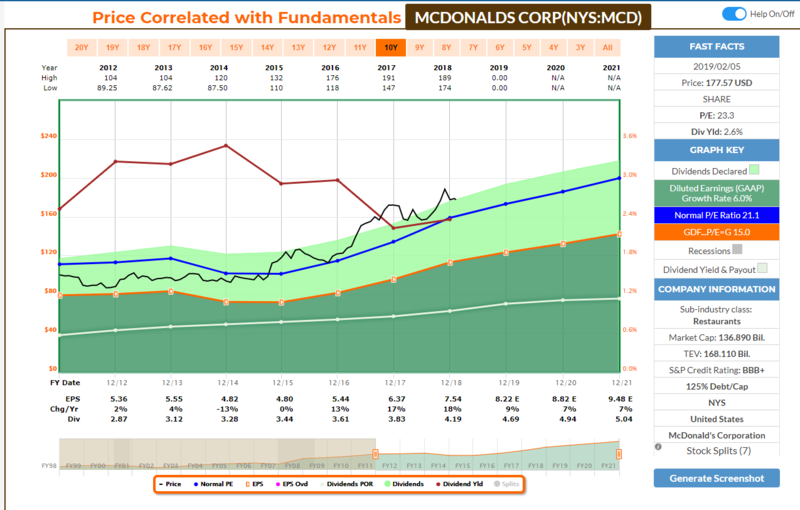 (02-06-2019, 03:30 PM)stockguru Wrote: I was thinking of buying MCD. What everyone's thoughts about taking a position here? It doesn't correct all the much but its off a bit from its highs now. With a 22 PE or so it may be a bit over valued, but I like that divided. Looks pretty steeply valued. About 10% above its 10yr average P/E, dividend growth rate has been flattening for the past couple years, current yield at multi-year lows, and lots of debt going into a late-cycle economy. I have a feeling there will be sale prices in the future much better than this. Hard to argue with buying MCD at almost any point so long as your time horizon is long. But it does go on sale now and again, though its cycles tend to be pretty long, in my opinion. The company seems to be doing pretty well now, 2018 earnings were great, and it has avoided significant negative press, and the share price reflects all of that. At some point in the next five years though, fast food will get trashed again, their stores will get dated again, and the P/E will compress and the yield will head up over 3 percent as people -- again -- lament its demise. That's when I like buying MCD. Then just sit back and wait for the refresh as the stock runs to new highs. In short, I can't recall a bad time to buy MCD shares (including now), but I can recall some way better times, and they'll come back around. Right. I have no doubt that MCD will continue to be a profitable going concern. That's true of most Dividend Aristocrats. That said, it just doesn't hit my value targets at the moment. I've owned MCD several times over the decades. There has never been a terrible time to buy it. That said, I sold my position last week above $185 for reasons not attributed to the company. I was just increasing my overall cash position a bit as I am tentative about the market it the short to midterm. MCD ran fast after my purchase and became one of the sell candidate. It certainly isn't cheap but $190 sure wouldn't surprise me. I'd like to see 160s to get back in. I am seriously considering it as core position when the next recession comes around. IMO VERY few restaurants qualify as safe for a long-term DGI hold. Added to AMGN and PRU this morning. My dad won two MCD stocks in the 70s in a raffle, now it is over 300 shares!